Port Vue is named for its view of the Monongahela and Youghioghenny Rivers. 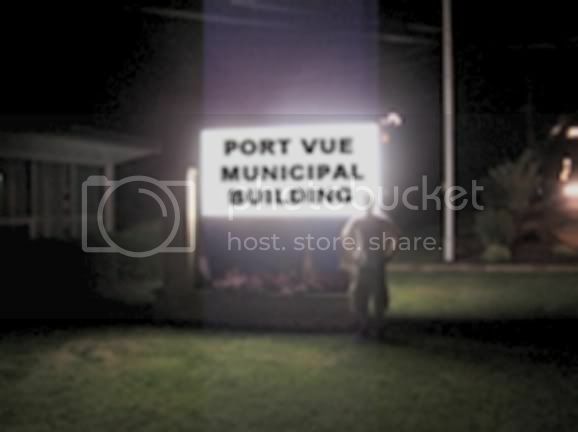 While this is an actual photo of the Port Vue Borough Municipal Building, we had some issues with the clarity of the lettering on the sign, due to its brilliance. Aside from the lone police car standing sentinel in front of the municipal building, we also observed what could quite possibly be oldest municipal vehicle in Allegheny County which remains in use: The Port Vue firetruck. Its ameninities include a permanant sun roof and one flashing light. I am not even sure if water can come out of it. If so, I hope the driver is wearing a poncho when it happens.